Realty is a product of our Dreams, Decisions and Actions. Contains trans fatty acids not more than 2 percent by weight and saturated fatty acids not more than 50 percent by weight. 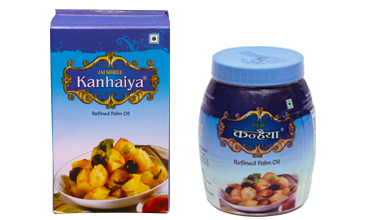 Shree Tadkeshward Agro Food Product was establishedin 2003 to provide the best quality edible Oil to the consumers in the form of Pure Refined Palm Oil. The company started of with just three Brand namely Jai Shri Kanaiyha, Shri Gopal, Bilowana. These Brands over the years have grown multitude and more Brands were also introduced like Shri Shyam Dhani, Arpan, Madhur Milan, Jai Shri Manthan, Utsav. © COPYRIGHT 2016. "Shree Tadkeshwar Agro Food Product. All Rights Reserved.